Summer Reading Here We Come - Let's Read Around The World! Read Around the World from tgaletti on Vimeo. Just three more days until the end of the school year 2015-16. Time to get ready for summer reading! I am inviting you to join me on an exciting (reading) journey around the world over the next nine weeks. I will show you some wonderful places, beautiful stories and fun activities. 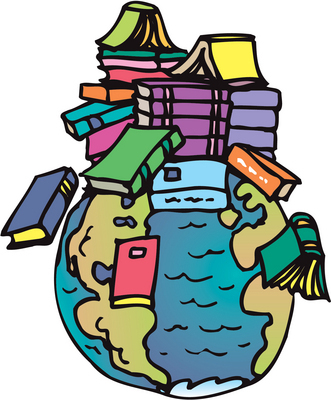 Each week from now until the start of the next school year, I will add a new post to the library blog with reading suggestions and some additional activities, as we move from one continent to the next. In addition to our Read Around the World package, which includes many title recommendations - picture books and chapter books from around the world - I have compiled an annotated list of summer reading suggestions for various grade levels (see file for downloading above). Please consider this list a mere starting point as you look for books to read during the break. The grade-level boundaries are meant to be broad and are mainly geared towards interest level since reading levels vary within grades as each reader develops at his/her own pace. Also keep in mind that stories can be enjoyed in many different ways: a child reading independently, a child and an adult sharing the reading, an adult reading out loud to a child, or a child listening to an audiobook for example. It is my hope that through the list, you discover stories you enjoy reading this summer. During this past week, our Primary School students visited the library one last time with their classes to listen to one more read-aloud, to brainstorm why reading during the upcoming long break matters and to find out about our summer reading program. As you can see in the picture above, our students had much to say about why they will continue to read this summer. In the past, I have often noticed that the younger the student the more importance is given to the "fun factor" in reading and the older the student more often the importance of maintaining reading skills is mentioned. This year I found that across grades students mentioned how much they enjoy reading, how much fun it is as well as that reading helps you to learn and get better at reading. I could also tell that writing has gained much in importance among our students since many mentioned that reading gives you ideas for making your own books, that it helps you to become a better writer. There was much excitement for our summer reading program too which will be under the theme Read Around the World. Through reading suggestions and all kinds of activities, our students can take a tour around the world over the next nine weeks. The entire program and additional title suggestions will be available for download on this blog from Monday, June 13, onwards. If you have good Internet access during the break, you can also simply visit the library blog each Monday morning to find out what books and what activities are suggested for the week. This coming week I will meet with all of our students one last time before the end of the school year to talk about summer reading. Remembering our conversations of past years, I know that there will be no shortage of comments from our students why summer reading matters. Not only do our students know that to maintain and further develop the reading skills they acquired during the school year, they need to continue reading. Our students always point out that reading makes long journeys more fun, keeps you entertained on rainy days, let's you travel to faraway places, even if you are not going anywhere right now, and is simply one of the nicest ways to spend time with people we care about. Summer is the perfect time for reading together, with family and friends, having more time to enjoy and treasure read-alouds. There are so many wonderful books out there that are even more enjoyed when they are shared and discussed with other readers (I will make some specific recommendations in next Monday's blog post). In this context, I will also suggest and introduce keeping a summer reader's journal/notebook/scrapbook. It's most fun when you get to choose your own notebook because you really feel it's yours right from the start. You can keep one as a family or let everyone have their own. Keep some kind of a tally about the different genres or generally the different kinds of books you read. Record all the books you read. I usually do that by writing down the date I finished the book, the title, the author, favorite quotes and any other responses I have to the book. Sometimes this response is what I liked about the book (and what I didn't). But there are so many other ways to respond: making a picture of a favorite scene, drawing an advertisement poster for the book, recommending the book to someone, writing a letter to the author or one of the protagonists, just to add a few more examples. If you like to make it more of a scrapbook, add bits and pieces from your travels, from the place you read the book at. Maybe you have a plane ticket, a train ticket, a postcard or a picture of the place to add for example. I like to use different colored pens so that I can easily find things when I am looking through the notebook ( a trick I learned from the wonderful author Lenore Look); for example I write all quotes in a particular color. I would love to see your notebooks after the summer. Will you show them to me? Happy summer reading, journaling and scrapbooking! During the past week, all classes visiting the library got to see a video with highlights of their grade level's year in the library. Students were excited seeing themselves in the pictures, some noticing how much they had changed since the beginning of the year, others remembering favorite learning engagements, favorite authors and books. The videos were a wonderful discussion starter for our EOY reflections and students in all grades, from our youngest in PK1 to our G5 students, had much to say about the past year: about stories we had read together, books they had checked out, author inquiries, inquiry circles, learning about different kinds of books (fiction/nonfiction, various genres) and where to find them in the library, about some of our special events (Literacy Week, author visits) and their achievements as readers and writers, thanks to the wonderful stories they had read. Our students in PK1 to G2 also got to listen to Mo Willems' newest Piggie and Gerald book, The Thank You Book. Students loved listening to the story and seeing many of the favorite characters from the other books in the series again. Then they got to think about whom to thank for helping them in being readers. There were right away so many ideas - parents, siblings, teachers, librarians, aunties, authors, illustrators, pets... - and students were eager to write their little notes to take home and/or share in school. Our students in grades 3 and 4 reflected on their personal reading lives during this past semester in particular by analyzing their check out history and then representing what they like as readers on a paper plate (just like our fifth graders did last week - click here to read their post). The enthusiasm with which our students embraced this reflection and the creativity shown on the plates was beautiful to see. I had a wonderful time with our students, looking back and celebrating a beautiful year. This morning during our last Upper Primary School assembly of the year, we celebrated our Battle of the Books team. Each student from the home and traveling team got acknowledged and received a certificate of achievement for their commitment to the team throughout the school year, for their efforts and dedication in trying to read 20 books, for learning all of the titles and authors of the books and for doing such a wonderful job during the competitions (first during the showcase at our school and then during the semi-finals at Shatin Junior School). Our celebrations continued during a pizza lunch in the library. Of course, we added one last (fun) challenge, in the spirit of a much-loved book from this year's B.o.B. list: Escape From Mr. Lemoncello's Library by Chris Grabenstein. Our students had to answer two questions connected to B.o.B. on entering the library, then they had to find the correct places on our library shelves for two of the B.o.B. books, before joining the lunch table. It was so much fun and in the shortest of time our enthusiastic readers sat around the table with the biggest of smiles, awaiting their first piece of pizza. Ms. Virginia joined us too and congratulated our team for their wonderful work, for their dedication and commitment. During the lunch, our students chatted about the books they had read, sharing favorite titles and those not enjoyed that much. It was really interesting to hear how much opinions on the individual books differed. There is really a book for everyone, while not every books is for everyone. Fortunately, the B.o.B. lists always provide readers with a wonderful variety, various genres, classics and new books, from all around the world. It was also fantastic to hear how many students want to continue next year, and have actually already begun reading some of the books. Most frequently mentioned from the new Secondary list was Pam Munoz Ryan's Echo; from the Primary School list it was Roald Dahl's Boy and Grace Lin's Dumpling Days. If you are going into grades 4-5 or into grades 6-8 this coming August, have a look at the videos below to see what fantastic books await you, should you decide to join our Primary or Secondary School Battle of the Books team next year. B.o.B. 2016-17 Primary Category from tgaletti on Vimeo. B.o.B. 2016-17 Secondary Category from tgaletti on Vimeo. What an exciting day it has been, indeed! We started the morning with our grade 5 students, who have been coming to the library for their scheduled visit every Wednesday morning for the past year. We enjoyed watching a video with some of the highlights of their year in the library, all amazed seeing how much we had done together: from thinking and sharing about who we are as readers, scavenger hunts to revisit the library set-up and organization of materials, genre explorations, a mini-inquiry into the concept of plagiarism and the importance of citing sources, to inquiring about authors such as Michael Morpurgo, Roseanne Thong, Rob Buyea and Jackie French and checking out lots and list of books. Next, students completed one more challenge, and then headed up to the Secondary School Library. Our fifth graders loved it! I know that so many had been looking forward to finally explore what the Secondary Library has to offer. Mrs. Hand, our Secondary School Teacher Librarian, welcomed the students and shared a beautiful story by Patricia Polacco, Thank You, Mr. Falker, telling our fifth graders how special each and everyone of them is and how much she is looking forward to having them in the Secondary Library. Afterwards, she took the students on a little tour and I could see much excitement on our students' faces about all the displayed books and the cool design of the library. The next event of the day was our Service Learning Fair, during which Ms. Alison and I got to share about the work of the Hong Kong-based NGO Bring Me a Book. Mrs Pia Wong, Executive Director of BMAB, joined us for the morning. She answered students' questions about the work BMAB does to increase family literacy around Hong Kong by installing bookbag and bookcase libraries, filled with high quality children's books and by training parents and teachers on how to read aloud to children. Mrs Wong shared read-alouds with our students too, had conversations with them why reading aloud to children is important and helped students make little booklets to take home. It was a wonderful opportunity for our students to find out more about the organization that received the money raised during our read-a-thon this year. Our students were excited to hear about the three sites that will be receiving bookcase libraries from us through BMAB. And after this exciting morning, all staff got treated to the most delicious lunch, organized by our wonderful parents. The annual staff appreciation lunch at HKA blows me away each year. I am touched by the generosity of our parents in preparing the most delicious dishes, and by the thoughtfulness of the gifts we receive. Many, many thanks to all of our parents!